Yes, in case you’re wondering, foremothers is a word, and my foremothers were strong women and survivors of one of the most devastating periods of our history – the Depression. 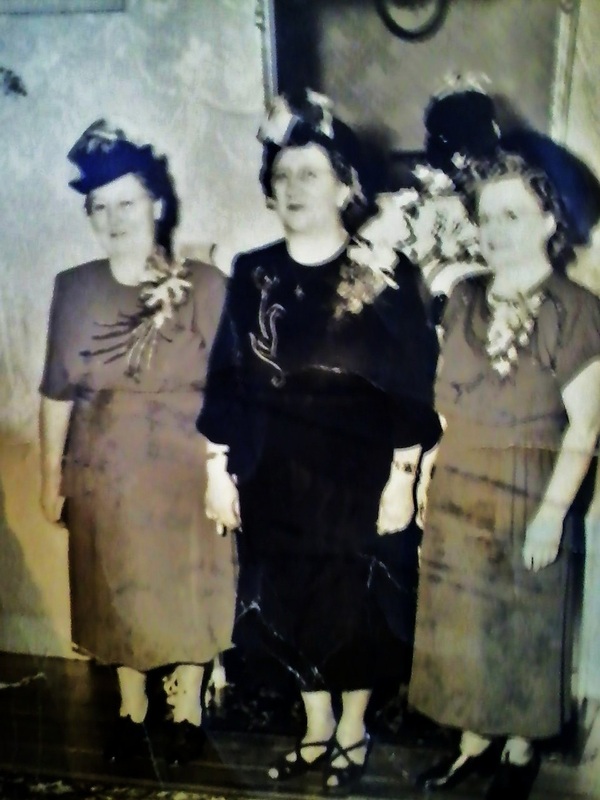 My grandmothers had beautiful names. Eva, my Dad’s mom, was a gentle soul with a big heart. She raised nine children in the worst of times, in poverty, with little of the comforts we enjoy. My Dad told me stories about their struggles that would make your heart bleed, along with the fact that my paternal grandfather was not the kindest of men. Still, my grandmother was not hardened by her circumstances. She was described as sweet and loving and protective of her children and friendly to her neighbors. In the midst of poverty, she managed to share her food with her hungry neighbors, providing an open house on Fridays for her delicious plotsky, which are Polish potato pancakes. Potatoes were the mainstay during that time. 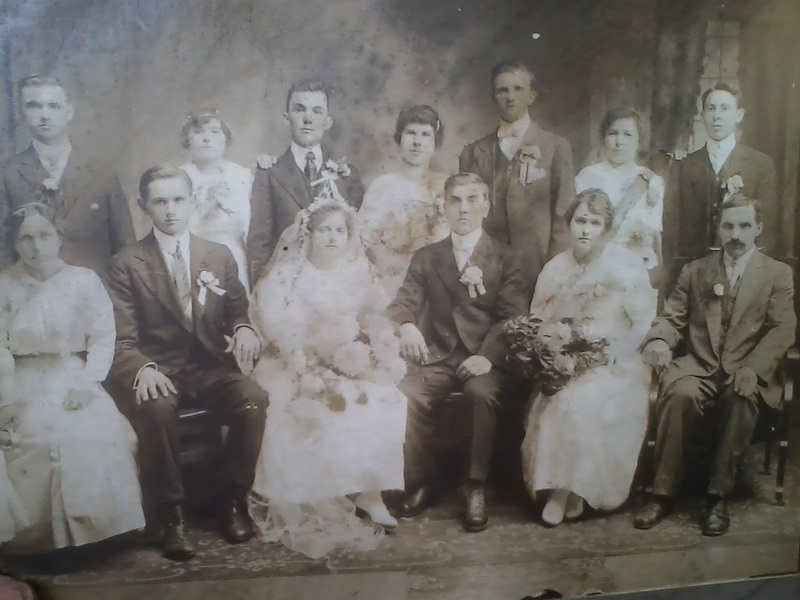 I don’t know too much about my Grandmom, such as when she came to America or how. But what I heard of her later in my life was only the fondness shared by her family, friends and neighbors. She died at the age of 56 from a heart attack. I was only 2 years old at the time, so, unfortunately, I don’t have any recollection of her and only know of her from the stories that were relayed to me later. Veronica, my Mom’s mom, is also a vague sketch in my memory, having passed of an aortic aneurism at the age of 62. I was eight years old at the time. She was a woman with a deep faith and unwavering values that she passed along to her eight children. I do have memories of visiting her at her home, sitting down at the old-fashioned, ceramic/wood kitchen table – just me and her. I can still see her looking down at me with her kind smile. I loved this time together, talking with her and answering the many questions she asked. I only later realized as an adult how precious that time was since there were always so many other people milling about the house. She always gave me her undivided attention and seemed very interested in what I had to say. Even though the conversations escape me – her attentiveness remains etched in my heart. She always had Swiss Miss cake rolls when I came over, my favorite. I would pick off and eat the chocolate, unroll the cake, lick out the cream, roll it back up and eat the cake. (Yes, I was a weird little kid! 🙂 ) Sometimes she made her scrumptious lemon meringue pie with fluffy white meringue layered higher than the pie itself – YUM! She was happiest when she was feeding us, and was all about the food and the comfort it brought. I continue her legacy, since feeding my family and friends remains one of the greatest joys of my life. 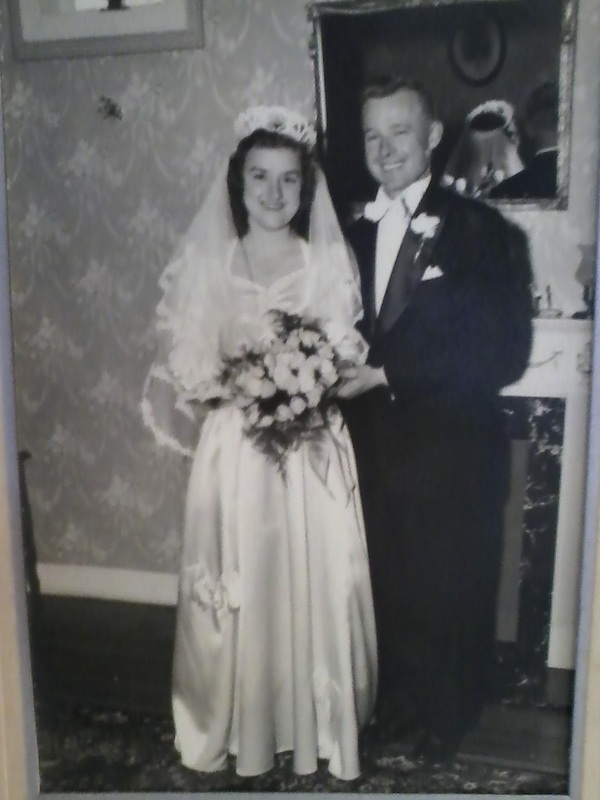 My parents’ wedding day – November 21, 1948. It was a hot summer’s night on June 6 when we got the call that she had passed. I had just finished watching a television show called McHale’s Navy. I recall being so incredibly sad, crying uncontrollably. My Mom’s disconcerting grief continued for a very long time thereafter, and it was upsetting for me to watch her heart-wrenching sadness. As it turned out, I would grieve my Mom’s passing in the same way. My family members are not noted anywhere in the history books for having done lofty things in their lives. But to me they are heroes. They were honest, kind and true, and they lived their lives in excellence with a strong faith, doing the best they could with what they had. I am very proud to be the third generation of such strong, loving, family-oriented survivors. And I realize that even though circumstances in life do get tough from time to time, I am ever reminded by these old pictures and memories of my forefathers and foremothers that I, too, can survive when the going gets tough. I am glad and grateful for these stirring memories brought about by a bag of old vintage pictures that unknowingly revived my fledging spirit with hope. Heat oil in a large, heavy skillet over medium-high heat. Drop spoonfuls of the potato mixture in the skillet, then spread into 3-inch cakes about 1/4 inch thick. Fry until browned on the bottom, turn and cook the second side until crisp, 3 to 5 minutes each side. Drain briefly on paper towels. Service with sour cream or applesauce.